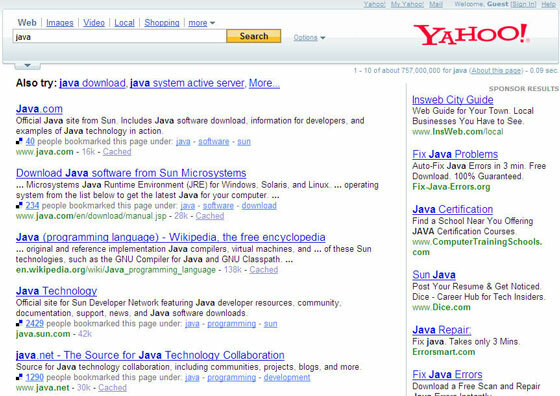 I just got word that Yahoo is testing the integration of Delicious user generated bookmarks into Yahoo search results pages (Yahoo acquired Delicious in late 2005). Some users will see the Delicious icon as part of their normal search results, which tells them how many people have bookmarked those pages, as well as the tags people have supplied for those pages. An example is here, and I’ve included a screenshot. I have previously written that Delicious search is one of the best ways of searching for things when a standard search doesn’t pull up what you are looking for. After Google, it is my favorite “search engine.” Adding this information into Yahoo search is a great idea. What isn’t clear is if Delicious results are impacting search rankings, or if Delicious data is simply being integrated into the existing rankings.